The Diocese has a large number of beautiful churchyards, including that in Ebrington. It is very important to preserve their beauty, which easily can be spoilt by the introduction of memorials of inappropriate material or design. From the legal point of view, the introduction of memorials into churchyards is authorised by the Diocesan Chancellor. The Chancellor has delegated certain powers to parish priests, who must apply these Regulations on behalf of the Parochial Church Council (PCC), which as a body is responsible for maintaining the churchyard, and may need to give its approval to certain decisions. No one has the right to erect a memorial on a grave in a churchyard without permission. It is essential to obtain permission before any order is given to a Monumental Mason or Funeral Director. Permission is given either in the form of a signed approval by the parish priest, or by way of a Faculty granted by the Chancellor [the Ecclesiastical Judge in the Diocese]. Requests for permission should be made in writing to the parish priest in the first instance, using the application form available from the Church Office, if the stonemason does not have a copy. Please note that a minimum of six months must elapse between the death of the person to be commemorated and the application for permission. Sometimes there will be existing examples in a churchyard of a type of memorial which is no longer permitted. This is not of itself a reason for granting permission for further examples. Polished stone is not permitted. Only certain materials are permitted. Stone memorials must be limestone, e.g., Cotswold, Portland, York, Nabrasina. The PCC is not responsible for maintaining memorials in churchyards. Checks may however be carried out from time to time to ensure that memorials have not become hazardous. If it appears that a memorial is in a dangerous condition, the PCC may decide that it should be laid on the ground in order to avoid accidents. Naturally, families would wish for the graves they look after to be kept in a neat and tidy condition. It should be noted that additional free-standing features such as toys, pictures, mementos, etc., are not permitted. Except where the design of a headstone includes an integral container for plants or cut flowers, flowers may only be placed in a removable pot, this should not be made of glass for Health & Safety reasons. Wreathes and cut flowers may be placed in such containers or laid on any grave, but must be removed as soon as they appear to be withered or dead. Ebrington PCC considers that fresh flowers are the most appropriate. The PCC may at its discretion at any time remove and dispose of any artificial flowers placed in the churchyard. Wreaths or cut flowers will be removed especially if it is considered that they have deteriorated and/or are unsightly. Bulbs and small annual plants may be planted in the soil of any grave. No trees or shrubs may be planted. 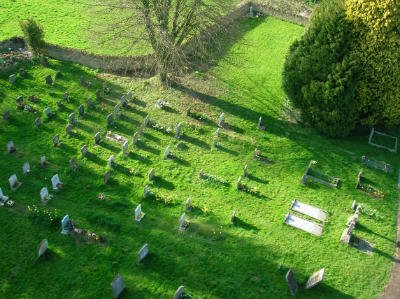 The full Diocesan Churchyard Regulations (2015) can be downloaded here.